Burn down your school and don’t build a new one. 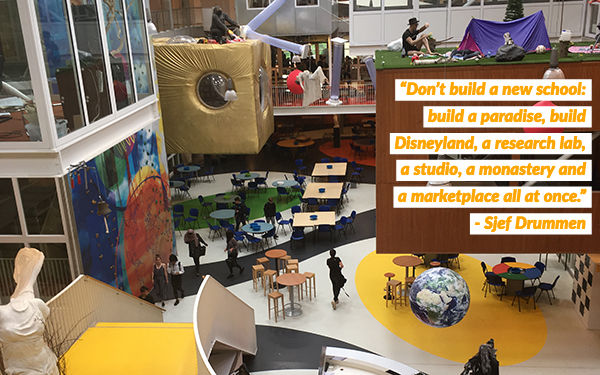 Don’t build a new school: build a paradise, build Disneyland, a research lab, a studio, a monastery and a marketplace all at once. But don’t build a school. Don’t build classes. Don’t build hours. Don’t stick to “ages”. Don’t use grades. This is how the school of the future looks like. I’m talking about the Agora school, located in Roermond, The Netherlands. And believe it or not, but this school has been educating students since 2013. So, actually, we’re already in the future, living in the past with our own traditional education system. In this blog post, I’ll explain to you how this offbeat school works. I interviewed its vice-principal and co-founder (and artist! ), Sjef Drummen, and along with my partner in crime we turned up the heat. What’s there to know about this school? How does it work? What’s so different about it? These (and many more) questions were asked and answered. What we do today is telling the student what they should learn. Students have to shut up and shut down their brain, and once that is done, the teacher can finally start. This means that there’s only one person in the entire classroom that’s using their brain: the teacher. Wrong. In the Agoraschool, teachers don’t get to be “teachers”. Teachers are schoolmothers or schoolfathers in charge of their family, which doesn’t exceed 17 students. They guide students from the age of 12 to 18. So, the students have a heterogeneous age and a heterogeneous cognition level. This family is their responsibility for the complete school year. This also means that the workload of this school parent concerning stress is zero. So why is this not the standard in every school? One of the qualities of a good teacher is to invest in a trustworthy relationship with the student. Because of the fact that students have a certain age (which is way younger than a teacher), they lack analytical skills. Their “prefrontal cortex” isn’t yet developed enough to take big decisions. And that’s where the teacher comes in. The teacher replaces their students' prefrontal cortex and guides them in the right direction. And students accept the teacher’s help because of their good relationship and confidence. Can you imagine teaching in this school? What does a teacher there look like? What are the requirements? Well, are you a nice person? Good! Because that’s all it takes! Teachers at the Agora school have to make sure students love going to “school”, and that these kids are bursting of self-confidence. A lot of teachers choose to become a teacher because they can work in a very structured way. But here, you have to let things go. That’s what they call “agile learning”. And this means to adapt your views from day to day. You can never tell how far you will get tomorrow or in a few months, because learning is a movement: sometimes it goes fast, then slow. The teacher has to be able to adapt to their students' learning processes. To teach in Agora, a teacher carries 3 suitcases with him. A diamond suitcase, representing a big heart for the students. Give students confidence and tell them they can reach for the stars and achieve anything they want on their own. It is proven that when a teacher creates the best learning environment for 10 years in a row, students' IQ grow with 40 points. So yes, teachers can really create an impact. A golden suitcase, representing everything on neurology, psychology, science, and how students learn the best. A lead suitcase, representing a highly radioactive substance that can only be given to students in small measures: knowledge. After applying the two first suitcases, the student’s learning process starts accelerating. Only then, teachers reach out into the third suitcase, causing a nuclear reaction of knowledge. At Agora, sudents have to set their own challenges. They decide what they learn during the whole year. 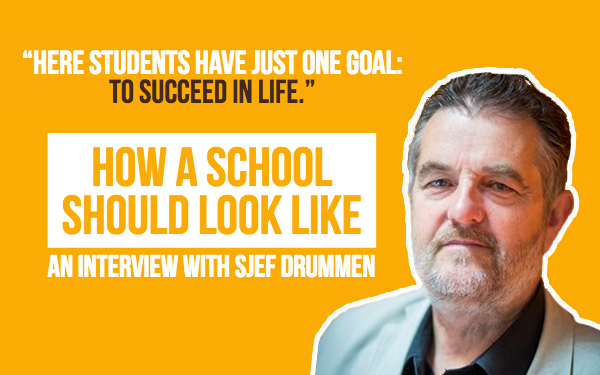 So, my instant reaction was to ask Sjef whether students have learning goals to work towards. Not even that. They just have one goal: “To succeed in life”. A lot of students find out themselves that if they don’t do anything, they won’t succeed. It takes insight to get there at the end of the year. The students take the steering wheel in their own hands. They have to steer the car in the right direction, and the teacher is only their driving instructor. And while driving, learning happens. Spark their curiosity, and they will find what they need to succeed. Don’t put roadblocks when you want them to go the other way; let them discover this by themselves. Students can build wings on their car to fly over those roadblocks. They’ll get there… and you have to let them get there. There are many students coming to the Agora school that have been damaged so bad for the past 8 years in education. They think they are too dumb to succeed in anything. These students need to be detoxed. You need to bring them in a situation where they feel confident and let them believe they can manage things. As soon as they realize they really can accomplish something, they come in a phase that they also want to learn new things. They’ll start setting new goals and new challenges from intrinsic motivation. And that’s the most important motivation there is. The detox program also teaches them the importance of focus when setting their own goals and when learning. The program starts in the beginning of their school career in Agora, and ends 7 weeks later. In these 7 weeks, students have to know what they want to become. Even if the chances of their dream job are so rare, at least, they have focus now. They have a goal. And it doesn’t matter if something comes on their road that changes their focus, as long as they replace it with a new focus. So what exactly are these challenges that students choose? Well, a challenge can be anything! Something students find interesting to research. 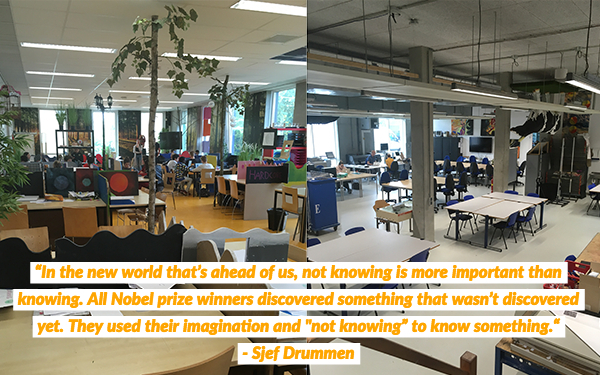 Starting from there, the Agora school uses the students' interests and motivation to encourage them to look further. What do they want to become? What do they have to learn to become that? Through their passion and interests, students also learn how to learn. That’s why they can finish these challenges all by themselves. Since there are no goals in this school, how is it possible for students to know when the challenge is finished? Well, there are a few things to consider here. First of all, students have to appoint the “why” of every challenge. “Why do I want to do this challenge?”, “Why do I want to learn this?” Initially, students will say “I like to learn about horses, because I like them.” This is the most simple explanation of a challenge. But after a while that student will start saying “I want to learn about horses, because I want to start my own riding school”. Here, the student is delving into the challenge much more than before. For every challenge, students formulate the definition of “done”. When is their challenge finished? They also define their challenges with a learning question and sub-questions. Most of the time, those learning questions lead to new topics they want to investigate and so, new challenges. Via technology, the schoolparents can follow up on them and their progress and give advice. They encourage students to make mistakes, because that’s the best way to learn. Copying is also an effective way to learn. Look at how another person does something. You could say that it’s not easy for students to find that one thing they’re passionate about. I myself only found out a few months before the deadline that I was interested in Communications. Only much later I realized I also wanted to become a teacher. In the Agoraschool, students can participate in Masterclasses, completely voluntarily. So, when there’s a masterclass about Sebastian Bach, everyone who likes to go, goes, and others don’t. 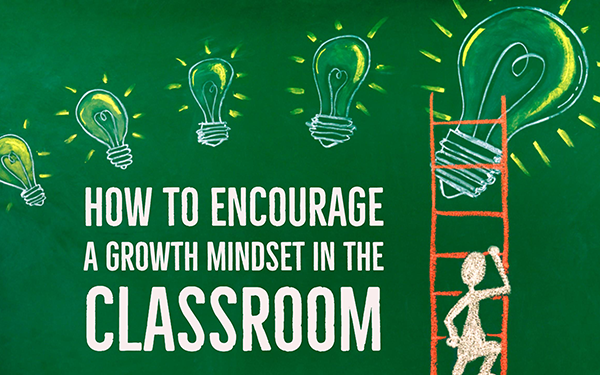 This is the right way to encourage students to learn. Technology is a very important component in this school. Because of technology, it’s possible for every school to offer hundreds of different learning paths. That’s why Agora is a 1 to 1 school, and that’s why it offers every student a device for free. Financially, this is a big cost to carry. But ethically, it shouldn’t matter in education whether you’re poor or rich: every student should have the same opportunities. Agora gets the same money as any other school. Only, they spend it on technology, instead of books. The things you can do with technology are unimaginable, and every school should embrace it. We’re all conditioned by our “old” education system, prohibiting us to think differently. The educational model is over 100 years old. Sure, it was effective … in that time. Now, there’s truly nothing you can’t learn. Students can tap into the collective brain lobe of humanity with a smartphone for free. So, why do other schools forbid this small device? That’s why the Agora school started “Learning 0.0”. You have to bring back students and teachers, and rid them from all the institutional nonsense that crawled into our educational system many years ago. So ask yourself: why are teachers the boss? Why do students sit in classes? Why do students have to listen to teachers, and not the other way around? Why do we have courses? A class schedule? Why do we have tests and homework? It’s all rubbish, and you don’t need it. Every teacher knows, even without testing their students, every student’s capabilities, strengths and weaknesses. So why should you put a grade on it, and do hours of grading work, when you know what the result will be? But knowledge isn’t the key here. The key is that students are progressing. If a student first got a four, and later he gets an eight, that’s much better than a student that gets sixes all the time. A student with an average of 8 but zero social skills can go to medical school, while a student with an average of 7.5 and a lot of social skills can’t. This is a waste of human capital, and it has to stop. So, Agora doesn’t test, nor grade. But that doesn’t mean students are completely left alone. They’re practically haunted by their schoolparent, and get feedback all the time. A student can always take the initiative to make diagnostic tests, with the emphasis on “initiative”: the student has to ask for it, and has to want it. Teachers arrive at school at 8am, and have a team meeting. Students arrive at 9am, which is neurological much better than to start earlier. Then, students start with a “dialogue” in their own “schoolfamily”, where they debate and talk about certain topics (for example, Trump and Kim Jong-Un’s meeting). At 9:30 am, students start working at their own personal challenges, or they choose to attend masterclasses (often given by parents). Last year, the school offered 283 masterclasses to students with diverse subjects, from astrology to martial arts. Students have sports two hours a week, and after the lunch break they have 30 minutes of “silence”. During these 30 minutes, everyone has to be quiet. No mobile devices, no talking. Students can take a power nap (for maximum 12 minutes), read a book, listen to their breathing and meditate. 99 Percent of the students choose to read. After the silent break, students go on with masterclasses or challenges. At 2:30 pm, students may go home without any homework. You often see that students find the motivation to go on with their challenges at home, without being forced to do this. From 2:30pm until 4:30pm, the schoolparents or teachers consult with each other about the students and their progress, learning paths, and so on. As the first paragraph already gave away, this school isn’t a school: it’s a paradise. The agora school doesn’t have long hallways with little classrooms. It’s something like you’ve never seen before. In the 21st century, the number one skill everybody should have is creativity. 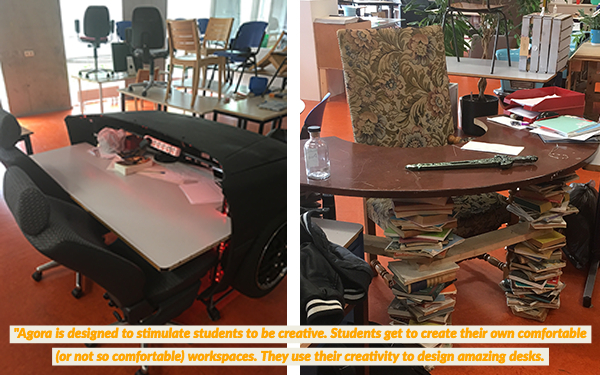 This school is designed to stimulate students to be creative: students get to create their own comfortable (or not so comfortable) workspaces; they use their creativity to design amazing desks; … The school has all the tools and workplaces available to spark creativity. Agora also lets students create their personal workspaces because it wants to take away boundaries: boundaries between their students' home, streets, school and their virtual environment. Students need to feel at home in their learning environment. The Agora school listens to the science and psychology of the student. Only those aspects of education that listen to the psychology of the student, survive. And let me tell you: there aren’t many. 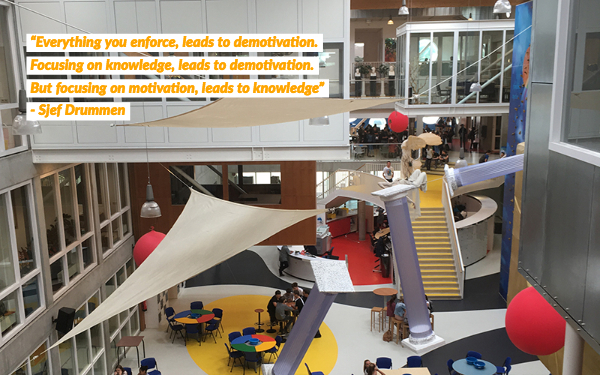 You don’t have to renovate education, you have to reinvent it. Renovation is like changing wooden wheels to rubber wheels. Reinvention is creating flying cars. And that’s what the Agora school did. 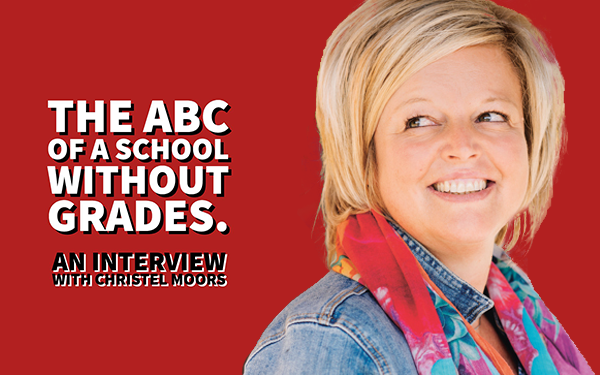 The ABC of a school without grades. An interview with Christel Moors. 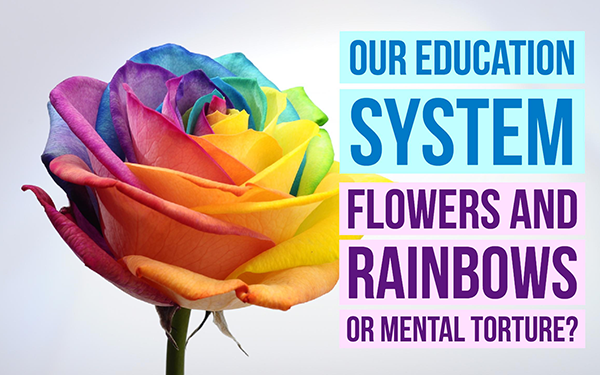 Our education system: Flowers and rainbows or mental torture?